1. What is Experience-based co-design? Experience-based co-design (EBCD) is an approach that enables staff and patients (or other service users) to co-design services and/or care pathways, together in partnership. The approach is different to other service improvement techniques. The approach was designed for and within the NHS to develop simple solutions that offer patients a better experience of treatment and care. However, similar user-centric design techniques have been used by leading global companies for years. Within health care, the approach has already been used in a range of clinical services, including cancer, diabetes, drug and alcohol treatment, emergency services, genetics, inpatient units, intensive care, mental health, orthopaedics, palliative care and surgical units. Further projects are also planned in acute cardiac care, paediatric services and dementia services. Throughout this resource we refer to ‘patients’, but this also applies to any service user of health and social care and their carers or loved ones. Over time the approach has evolved and has been adapted in different ways by different sites. One major adaptation is accelerated EBCD, which replaces the individual patient videos with existing videos from an archive, which have been found to trigger a similar response in patients despite requiring half the resources of the full approach (see Section 15, Adapting the approach to your budget and Case study 4: Using archive film to develop an accelerated form of EBCD). Some projects have involved carers as well as patients (for example, see Case study 2: Developing a support package for carers of patients undergoing chemotherapy). Further adaptations may be needed where it is used with patients who may be vulnerable, including people with mental health problems, dementia, young people or those with learning disabilities. Some of these are issues discussed in this resource (see Case study 1: Running EBCD in a mental health inpatient service). EBCD focuses on patient and staff experience and emotions rather than attitudes or opinions. The approach uses storytelling to identify opportunities for improvement and focuses on the usability of the service for patients and staff. It empowers staff and patients to make changes. Because the approach is qualitative, not quantitative, it provides rich insights into the experience of patients. 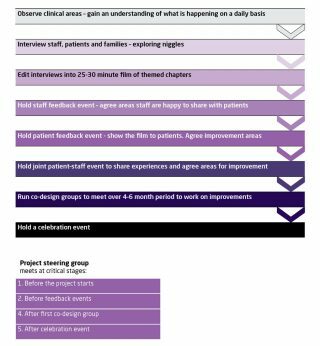 By filming the stories of people’s experiences, and then bringing staff and patients together to prioritise areas for improvement and define key actions, it becomes extremely focused and leads to clearly demonstrable results. There is a growing body of evidence showing the effectiveness of the approach (see Section 2, Is experience-based co-design for you? and the case studies that accompany this toolkit). EBCD is an adaptable approach. To find out more about ways that it can be tailored to different situations, see Section 15, Adapting the approach to your budget and accelerated EBCD. 2. Is experience-based co-design for you? 16. What next for your EBCD project?